Entries from Digital Intelligence tagged with "doubleclick"
Google’s ad system is getting a major overhaul this week that will see its flagship AdWords and DoubleClick advertising products renamed under a new streamlined platform. 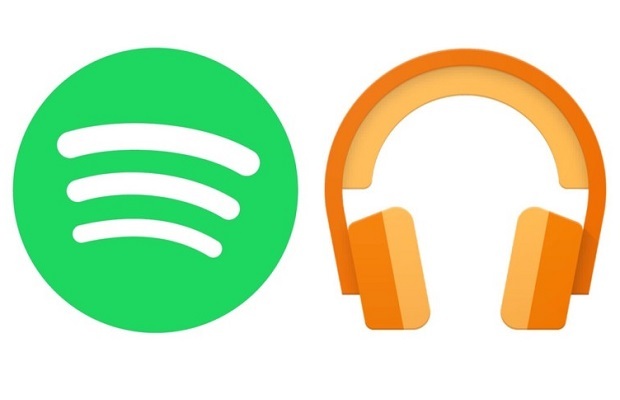 Google has begun the global roll out of Digital Audio Ads on DoubleClick Bid Manager, letting advertisers send radio-style programmatic ads to Google Play Music, Spotify, SoundCloud, TuneIn and soon Pandora. Google is bringing DoubleClick to billboard ads for the first time, a move that could revolutionise outdoor advertising. Google will start telling US advertisers and publishers to what extent their digital video ads are being seen, keeping with the Media Rating Concil's standard. Google considers Amazon as its biggest search competitor, ahead of traditional rivals like Yahoo and Bing, as people looking to buy something are more likely to search on the online retailer’s website. Google’s DoubleClick, Yahoo and AOL have joined Microsoft Advertising in being awarded seals confirming they meet industry-agreed standards to protect brands’ safety online. Twenty companies have now been issued seals in the UK. Facebook to launch DoubleClick rival next week? Facebook will reportedly launch a new online ad service next week that will track users across the web, letting brands target them on the social network based on their internet habits. With a staggering 90% of the world's data created in the last two years alone, it’s little surprise that advertisers are turning to automated trading platforms to make sense of the flood of consumer data- but jargon and lack of knowledge still hampers industry growth. As one of the biggest players in the ‘big data’ revolution, Google held its first UK conference on programmatic ads last week to shed more light on the fast-growing industry. Robin Langford, Editor at Digital Intelligence, was there to report on their take on the future of ad trading. Google will create a premium, programmatic Web video ad exchange to capitalize on shifting ad budgets and further entrench itself into the digital-video space. Google to charge advertisers "only for ads that are seen"
Google has revamped its display ads so that advertisers pay only for adverts that are actually seen online. In a major U-turn, Facebook is finally allowing Google to run is Doubleclick display ads on its ad exchange. Google is letting games developers use its DoubleClick Ad Exchange, allowing them to bid for TrueView's "skippable" pre-, mid- and post-roll video ads. Google has launched DoubleClick Studio Layouts, a new production tool for building and publishing rich media and HTML5 ads. News publishers are running three times more video ads this year than last, with huge rises in investment coming from the automotive, sports and shopping sectors, according to new data from Google’s DoubleClick ad network. Google is testing a new tool that helps companies build their own customisable real-time bidding platforms using its cloud and DoubleClick services. Atlas acquisition: Is Facebook planning a ‘DoubleClick for social media’? After its rocky IPO last year, Facebook has started to see success with its mobile and web ad revenues- and Atlas could help it develop an ad network for social media to rival Google’s DoubleClick. Channel 4 has launched ‘Data Baby’, a new experiment that will monitor how an individual web user’s habits are tracked and used by online advertisers. The experiment will look at how technology such as Google’s DoubleClick has become more sophisticated, moving from traditional cookie tracking to location, frequency and device monitoring techniques. Facebook is reportedly planning to buy advertising platform Atlas from Microsoft, as the social network looks to overtake Google in the display ad sector. 2011 saw American publishers account for the highest percentage of online impressions. 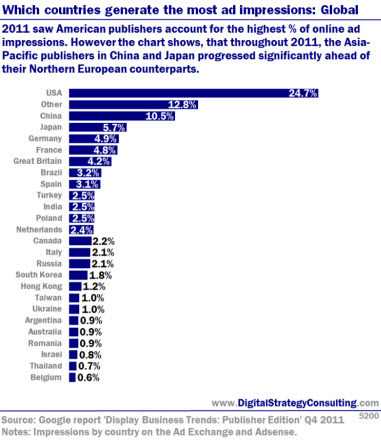 However, the chart shows that throughout 2011, the Asia-Pacific publishers in China and Japan progressed sigificantly ahead of their Northern European counterparts.